Everyone knows that there is a relationship between the many insects and decline of plants. A research in U.S. has found links that exist between a highly damaging beetle on ash and the presence of an isotope of carbon. It was all related, then, to the visual evaluation of effector parameters normally used. Insect and ash. Agrilus planipennis Fairmaire (EAB) was inadvertently introduced to North America from Asia in the 1990s and was first discovered in Detroit. EAB has been radiating from Southeast Michigan resulting in the widespread death of ash trees across 18 states and portions of Canada. In North America all native species of ash are very susceptible to attack by EAB. The genus Fraxinus is geographically distributed in 48 states in the U.S. and abundance in the presence in the Great Lakes region. The life cycle of the EAB begins with egg deposition on the bark surface and inside bark cracks during the summer by adults. The eggs hatch about two weeks later, creating a tunnel bill in the region of the trunk. The larvae overwinter as pupae, emerging through the bark , producing a characteristic exit hole D-shaped, in the month of May at latitudes of 39-42°. Depending on the condition and health of the tree, can make 1-2 generations year. The larvae burrow typical serpentine galleries of nutrition. 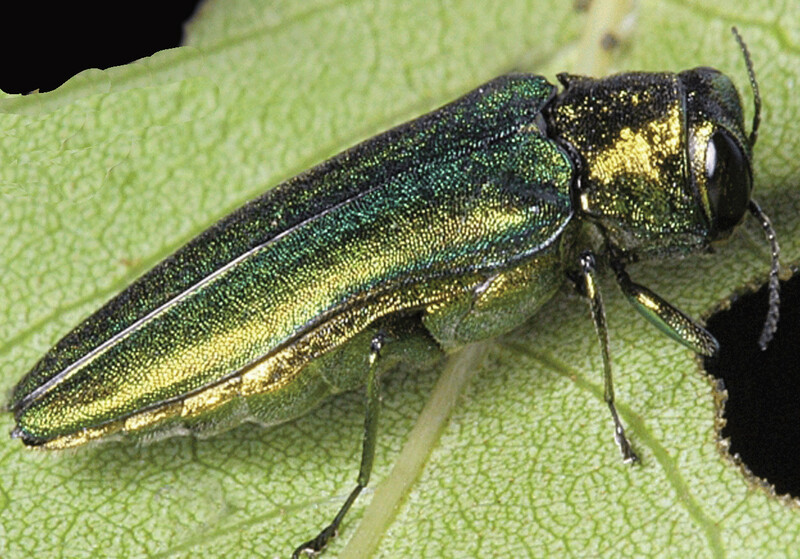 Although it is difficult to determine the time of the initial infestation, EAB has been observed on mature ash trees died within 3 to 5 years from infestation. Links between water stress and disease. While the symptoms of infection (decline of the canopy, exit holes, epicormic sprouts emission) have long been recognized, the mechanisms at the base of tree mortality are still not completely certain study sought to quantify the relationship between the presence insect and decay of the crown, without, however, quantify the duration of the larval stage and neglecting the mechanism of mortality, probably caused by water stress. The activity of the larvae are thought to have influence on the phloem tissue of the tree, making it no longer able capable of transporting water and essential nutrients. A visual system to assess the state of the canopy has been developed for the ash and has been widely used in ecological studies . This system is uniquely suited to the progression of the disease, indicating where the foliage can be thinned before the stage of complete decay. However, the relationship between this scoring system and the presence of galleries has never been linked with the physiological mechanisms of water stress. Provide an understanding of the physiological basis behind the degree of decline of the plant, may allow a better understanding of the eco -physiological responses of the ash. Study on Carbon Isotopes. The objective of this study was to quantify the mechanism by which Agrilus planipennis Fairmaire causes the death of the tree and put it in relation with the system of visual assessment of the decay of the foliage. To quantify this mechanism, were taken samples of mature ash trees in a forest early successional quantifying the population of EAB, cover gallery, and finally the stable isotopes of carbon in the leaves. Stable isotopes as indicators of chemical and physical dysfunction and can be used to study the interactions between plants and their surroundings. The carbon in nature , exists in two stable isotopes : 12C , 13C. The first is more abundant in the atmosphere and affects in the biochemical reactions , such as photosynthesis. Previous studies have suggested that the presence of 13C foliar reflects an integrated measure of the intrinsic water use efficiency. During periods of stress, such as those induced by EAB or unfavorable weather conditions, the stomatal closure can cause the plant to incorporate more of the heavier Carbon . Thus, the goal of the study was to evaluate whether the presence of 13C leaf was positively correlated with the percentage of nutritional galleries in the phloem. Selection of trees and the state of decline of the canopy . This study was conducted from 2008 al2010 in a forest of 15 hectares in Delaware. This forest is dominated by ash (Fraxinus americana L. and Fraxinus pennsylvanica Marshall) . Forty- four Fraxinus americana Fraxinus pennsylvanica (29 trees in 2008 and 17 trees in 2009) were selected because they have shown symptoms of deterioration of the crown . The trees ranged from 8 to 25 cm in diameter at breast height . The condition of the foliage was evaluated using visual methods , according to a scale from 1 to 5 . The leaf tissue was dried and subsequently analyzed for its isotopic composition of carbon. Statistical analysis and results. The relationship between the isotopic composition of carbon on the leaf and the percentage of area covered by larval galleries was evaluated using a mathematical model of linear , coupled with another model that indicated the visual classification of the status of the foliage of the plants. The isotope 13C in the leaf showed a significant positive correlation with the percentage of larval galleries shaft. The isotope 13C has become higher, when the visual classification of the foliage was 1 to 4 . On the other hand , was lower with more healthy trees and foliage classified by 3-4. The presence of EAB and the presence of tunnels on trees of each condition class, indicates that the insect can have an impact on healthy trees that do not . The density of EAB (insects per m2) and the percentage of coverage of larval galleries , have a major impact on the health and status of the plant canopy . Were found significantly fewer insects and lower rates of larval galleries in trees with a healthy head of hair (classification of the canopy 1) with respect to other classes of classification. The positive relationship between foliar 13C and the percentage of larval galleries , indicates that Agrilus planipennis Fairmaire causes the death of the ' tree because its supply of larvae that create a coil capable of inhibiting the flow of nutrients and water between the canopy and roots . This reduced acropetal transport of water causes the isotopic enrichment of carbon in the leaf tissues of the ash . In addition , the relationship between the condition of the hair and leaves the isotope 13C, gives support to the long-held notion that carbon isotopes can be used to reveal the physiological state of a tree. The study highlights the negative effects of EAB on ash health. The results indicate that EAB larvae may be present in trees that appear to be in good health and that the status of the foliage is strongly related to the presence of larval galleries.